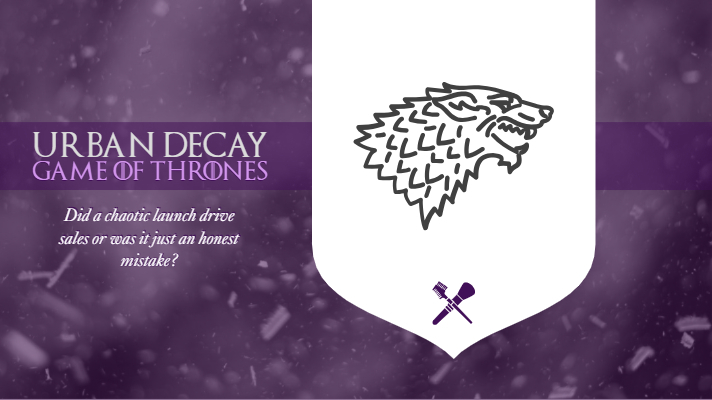 Is the Urban Decay and Game of Thrones makeup collab the most hyped launch this year so far? As a fan of the series and makeup, it was for me. I managed to snag the vault, my first one from Urban Decay, but it wasn’t without a lot of stress. Before I get into the review I want to share my thoughts on the launch and how Urban Decay needs to do better. Up until the night of the launch I was on the fence about buying it. On one hand I do love Urban Decay and Game of Thrones, but on the other was the cost and my previous experience with another of their launches. I stayed up and waited for the 12 AM PST countdown. Meanwhile, I did some homework. I started watching videos and reading reviews from those that received the collection as PR. During that time I became more convinced that I should go ahead and grab the vault to satisfy the collector, makeup junkie, and fan in me. I don’t typically purchase makeup from their website because I can’t utilize Ebates on it (come on guys, get it together). I considered waiting for the collection to become available on either Ulta or Sephora. However, flashbacks to the Basquiat collection made me decide to stick with Urban Decay’s website. That collection left a sour taste in my mouth. They advertised the vault as an Ulta exclusive. I waited up until 3 AM (since I’m on the east coast) for the vault to be available. Unfortunately, the vault never appeared online. After a lot of other customers complained on social media I saw something that said that Ulta never received the vault from Urban Decay. I’m not sure if that was the case in the end, but it’s the only answer I saw. The last thing I wanted was to go through that again. This is where things went to hell and Urban Decay became the Littlefinger of the makeup world. I checked the countdown around 1:30 AM EST. It was still going but I refreshed the page and suddenly things were very different. The countdown was gone and it appeared that the collection was available. However, it was all “sold out”. I thought that maybe, like many do, the site had been altered to prepare for the launch. Twitter would have me believe otherwise though. A few people reported that shortly after 12 AM EST (not PST) the collection went live and sold out in seconds. Shortly after items showed up on eBay. This lead to mass anger on social media. It wasn’t just your typical makeup lovers that were upset. First time purchasers felt lied to. Men wanting to buy it as gifts for their wives were left confused. People that signed up for email and text reminders never received them prior to the “false start” as I’m calling it now (more on that later). Even worse, people were reporting conflicting times directly from Urban Decay’s social media on when the launch was actually supposed to happen. Meanwhile, the company stopped responding to comments and questions on social media around the time that this happened. Whether this was a plan to drive demand through the roof the moment the products launched, or just an error, it should have been handled better. Simply responding to customers that the launch hadn’t happened yet would have saved many people undo stress. I saw many people posting about taking on extra shifts and work just to save up to buy these products. These weren’t typical Urban Decay customers, but first time buyers. It was all in all terrible customer service not to reassure people. I continued to check the site and refresh every now and then, with dwindling hope that the collection would be available when it was time for the actual launch. However, around 3:05 AM the Add To Bag button appeared. I managed to get the vault after putting the order in as quickly as possible. Soon others started posting online that they were able to get it, but a lot of things did sell out quickly. In fact, as of writing this around 6 PM, the only thing left if the eye shadow pallet. When I woke up this morning I had received my email notification for the launch, however it came in at 5:11 AM, a good two hours late. I personally don’t think that’s acceptable for a launch of this magnitude. I also did just receive my shipping notification in the middle of writing this. It takes a small amount of stress off my shoulders knowing that I am definitely getting it. There could be many reasons for the lack of communication during the hours before the launch. A simple answer could have been that customer service was closed. However, with a launch so highly anticipated it would have been prudent to have people on hand. Instead Twitter and Facebook started melting down while the brand sat silently by. If you’re planning to get the collection, especially the vault, go and see if you can pre-order it. I have seen reports of some stores allowing this, but it could be on a person to person basis. Otherwise prepare to do battle with everyone that missed out when the collection hits retailers online April 29 and stores May 2.